Clickworker Review: Is It Legit? Can You Really Earn Money Doing Clickworker Jobs? 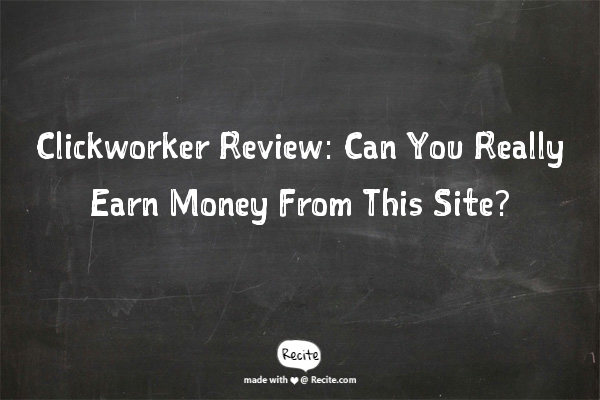 In this honest and comprehensive Clickworker review, I am going to talk about my experiences with the website. I signed up with the site in June of 2016 so everything that I've written below are my experiences with the site from said date and onward. In the future, I will attempt to regularly update this review should I come across new information about the experience of using the site to earn extra income. But before anything else, what exactly is Clickworker? In the simplest of terms, it's a site that pays people to perform micro-tasks. If you are familiar with Amazon's Mechanical Turk service, Clickworker works almost the same way. You sign up, you perform micro-tasks (writing short articles, categorizing images, comparing search results, finding contact information about business establishments, etc. ), you get paid. If that's something you think you can do part-time (or full-time for that matter), please read on. 1) A good command of the English language. Ninety-nine percent of the jobs you can get through the Clickworker platform are in English. If you are not that good in either writing or speaking in English, you won't get far in the site. I would also like to mention here first-hand that there are several tests that you need to take and pass before you are able to take jobs. Majority of these tests are on English grammar and proper sentence construction. If you are a native English speaker, the tests are a walk in the park. But if you are not a native English speaker, at least make sure that you can write proper English before you take the tests. You can't retake most of the tests. Furthermore, should you pass the tests and are able to take some of the jobs available, your completed work will still be reviewed. If your work doesn't meet quality requirements, it will be rejected. That also means you won't be paid. 2) You should have Internet Explorer as your browser. Yeah, I know, this is kind of frustrating because who uses Internet Explorer these days? But it is what it is. Clickworker requires you to use the Internet Explorer browser when taking the tests and when doing tasks so you really have no other choice but download and install the browser. One of the best sources of micro-tasks for Clickworker is UHRS (Universal Human Relevance System), a webpage hosted under Windows Live Spaces which is Microsoft's own blogging and social networking platform. You can only access UHRS with a Live ID. This I think is the main reason why Clickworker requires their members to use Internet Explorer. Keep in mind that Internet Explorer was developed by Microsoft. 3) A Paypal account. Clickworker offers two methods of payment. You can get paid directly through your bank account or via Paypal. However, you can only be paid through your bank account if your location country is part of the SEPA (Single Euro Payment Area). That said, I highly recommend that you get a Paypal account. You can get paid wherever you are in the world. Getting a Paypal account is easy. If you have all of the above requirements, you are good to go. Sign up now and start making some extra cash! Signing up is quite easy. Just go to the official website, find the "register button", and simply fill up the form. You don't have to take tests to become a Clickworker member. However, you can only take Clickworker jobs if you pass any of the tests referred to in the site as "Assessments". As I mentioned earlier, these assessments are quite easy if you have a decent grasp of the English language. 1) Placement Test - English: Before anything else, you should understand that this test is not repeatable. If you fail in your first attempt, there won't be any second attempts. You also need to pass this test before you can take any of the other tests. Anyway, this was a very easy test for me. There are 72 questions which you need to answer within 40 minutes. After completing the assessment, I got a score of 97% which means I only answered a few questions wrong. The questions are very simple (standard questions on grammar and sentence structure). 2) Qualification for UHRS I: This assessment is a bit more difficult than the Placement Test - English but it's very easy nonetheless. If I remember correctly, there were only 27 questions, each of which you have to answer within two minutes. In this test, there are two types of questions - there are the standard questions on English grammar and sentence structure and then there are the questions that require you to look for the contact details of a certain business or company. The URL for the website of the company will be provided so you can scour for their contact information. Anyway, this should be peanuts. I got a score of 93% here. 3) Qualification for UHRS II: This test is just to make sure that you understand what you've got yourself into. It's just a series of multiple-choice questions about some of the features of the Clickworker website. It's so much easier than the two other tests I discussed above. How easy? Well, I got a 100% score. It's that easy. 4) Qualify as an Author for English at Clickworker.Com: In this test, you are going to do just one thing. And that is write a simple and short review. Clickworker is going to give you a topic - it could be a movie, a music album, etc. - and then ask you to write a short review that contains between 90 to 120 words. That's just about two paragraphs with several sentences each. Anyway, I wrote my short review and received a rating and comments a few hours later. I got a 100% rating plus comments that described my spelling and grammar as "good". You have two hours to write the review so I suggest that you take your time to polish your article before you click on the "submit" button. 5) Proofreader for English Qualification Assessment: This consists of 23 questions that will assess your ability to identify and correct spelling, grammatical and punctuation errors and mistakes in English. To pass this test, you should get a rating of at least 80% at the end of the assessment. Again, it's an easy test if you have decent English writing skills. When I completed the test, I received a rating of 97% which means I probably got just one or two of the 23 questions wrong. I've earned nothing so far from Clickworker. It's very disappointing at this point. I've completed five of their "Assessments" with flying colors. Yet here I am checking out the jobs section in Clickworker and in UHRS and there's absolutely no tasks there for me. I'm starting to think that Clickworker is only good for workers based in the U.S., Canada, and the United Kingdom. They get all the tasks. All other countries get the bread crumbs. Oh well. Does Clickworker Have An Affiliate Program? It's nice though that Clickworker has a decent affiliate program. You can earn 5 Euros if someone you referred earns his or her first 10 Euros. However, I think this is a one-time payment. Once you get paid for the first referral bonus, that's it. It's been a week already since I joined. I've completed five assessments in flying colors. And I haven't seen a single available job for me. It's quite disappointing, really. So here are my thoughts: if you are from the U.S., Canada, or the U.K., Clickworker and UHRS may be a good source of extra income for you because you will be receiving a steady stream of tasks. If you don't live in any of the countries mentioned, Clickworker and UHRS is not for you. You will be wasting your time everyday logging in only to see that there are zero jobs for you. But if you are a good affiliate marketer, you can take advantage of the site's affiliate program. Maybe you can make a little bit of money there. Edit: So I sent Clickworker an email to ask why I'm not seeing any jobs even though I completed five assessments. Well, they replied and it looks like I didn't set up my UHRS account properly. So they fixed the thing for me and now I'm able to see jobs in the UHRS portal. So I'm taking back the things I've said in my "Conclusion" above. If you're not seeing any jobs in UHRS, I suggest that you send them an email. There's a chance that you are not seeing any jobs because you didn't set up your UHRS account properly. This has been my experience with Clickworker so far. I will be updating this Clickworker review if necessary. If you want to join the site and start earning a few bucks in your spare time, go here. Good luck!